As summer vacation just ended, the thought what to feed my daughter in the morning started bothering me again. My daughter goes to school very early in the morning. She usually has only one glass of milk in the morning. She is also a very picky eater, which limits my cooking options. I keep experimenting with shakes, smoothies, etc. I try to make the food as filling as possible so that she does not feel hungry until her break time. 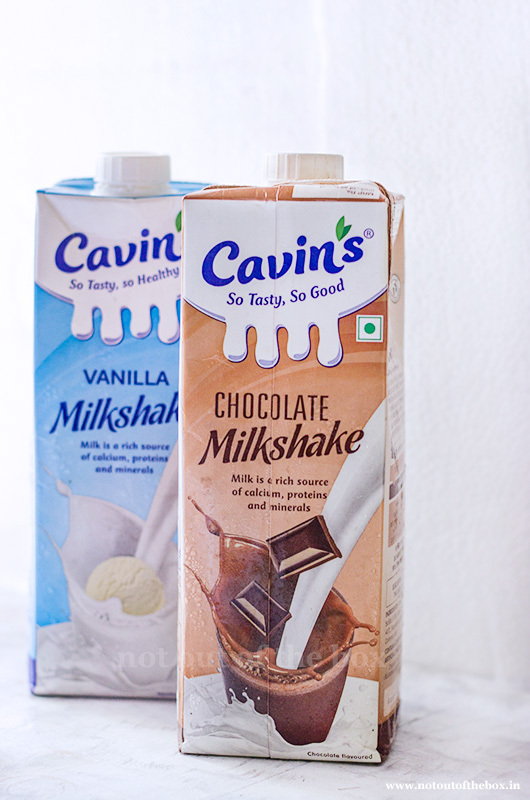 Recently I came to know about Cavin’s Milkshake which is Cavin’s flagship products. I have heard that Cavin’s milkshake is thick and creamy in texture compared to the other ready to drink milkshakes available in the market. I picked two of their flavoured milkshakes – Chocolate and Vanilla. The other flavours were Strawberry, Coffee and Butterscotch. I’ve found these shakes not only rich in protein, calcium and minerals, but also they’ve all the goodness of cow’s milk, which is procured directly from farms and processed in state-of-the-art European UHT facility and packed in aseptic technology without added preservatives. Milk has proteins, including healthy whey proteins that aids in building muscles and helps children stay active and fit. Cavin’s Milkshakes taste great when served chilled. So, try serving them on your next weekend party, I’m quite sure that people will enjoy and come to you for a second serving. These are tasty milkshakes with the addition of vitamin A, B and D. One 200ml pack comes for INR 25/-only. You can buy them online from Big Basket or try your nearest Supermart to get a few packs. They’re convenient to carry anywhere and can be packed with your kid’s school tiffin as well. Sufi, my daughter, loves chocolate Milk in general. I introduced her to the Cavin’s Chocolate Milkshake and she started liking it immediately. I felt really happy to see that now she has more options for her milk. These shakes are a tastier alternative to regular milk. 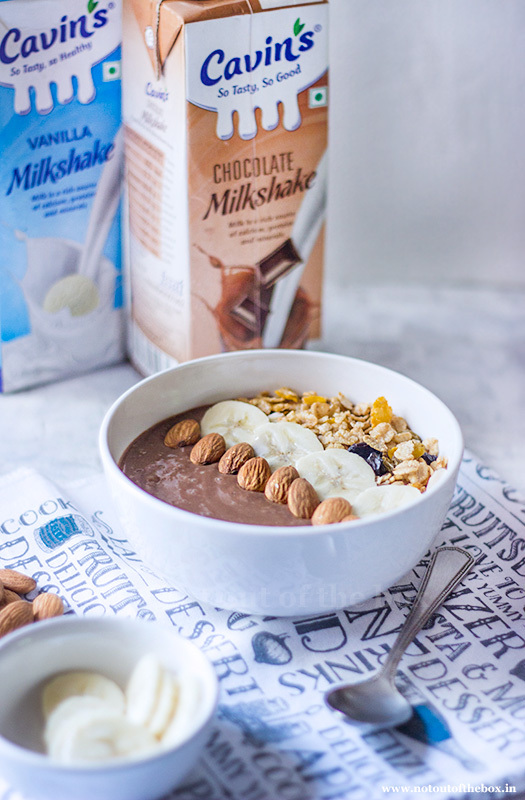 The next day I made a breakfast smoothie bowl by using Cavin’s Vanilla and Chocolate Milkshake. It turned out to be so delicious that she finished it without any fuss. I’ve found that the Vanilla Milkshake of Cavin’s works as a wonderful base for any fruit based shakes. Lately, I tried blending a few seasonal fruit pulps with it, and we’ve got some wonderful different fruit flavoured shakes, which we enjoyed at home. The thickness of these milkshakes adds a great taste to the fruit shakes. 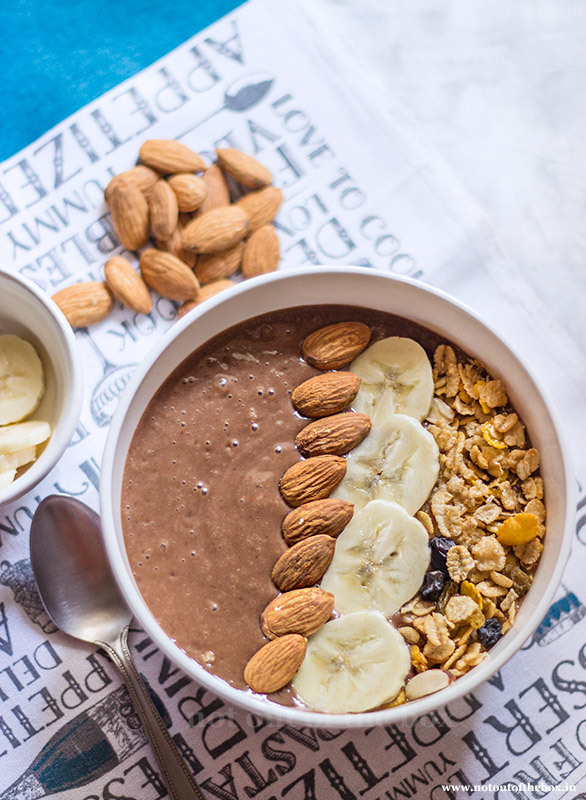 Coming to this Smoothie Bowl recipe, I’ve designed it in such a way that it can be made easily under 10 minutes. The ingredients are very handy and can be found in everyone’s kitchen. As Cavin’s milkshake is healthy and tasty, this smoothie turned out to be a healthy breakfast. It has the goodness of almonds, flax seeds and bananas in it. This is a healthy, nutritious, power packed breakfast bowl which gives you energy to cope up with all the busy morning activities. Here is how to make it. Soak almonds with some water in a bowl for 6-7 hours or keep it overnight at room temperature. Next day discard the water and keep aside. Add Cavin’s Vanilla Milkshake, Chocolate Milkshake, bananas, soaked almonds, flax seeds powder and unsweetened cocoa powder in a blender and blend until smooth. Transfer to a bowl and garnish with the ingredients mentioned ‘for topping’.